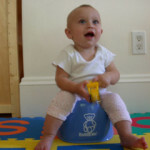 The following pictures demonstrate common holding positions to potty a baby. For demonstration purposes the baby is fully clothed. SAFETY NOTE: Please remember that the safety of your baby is of primary concern. Therefore, the baby should always be given appropriate support for her age and development. 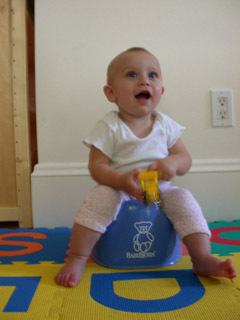 A younger baby will need more head and neck support and an older baby will need support while sitting. Common sense should be used at all times, and baby should never be held over an unsafe location (such as a portapotty).